The award-winning Jameson House is an impressive example of sophisticated design, heritage restoration and world-class architecture. Foster + Partners used the opportunity for their first building in Canada to combine Vancouver's spectacular views with its vibrant, urban heritage in the heart of downtown. Offering 11 floors of commercial office space, over 130 luxury suites, ground floor retail space and a highly efficient automated parking system, Jameson House combines bold architectural style with the restoration of adjacent street level 1920s heritage buildings. No details were spared, from the intricacies of the interior decor to the staggering of the residential tower columns in order to provide unrestricted views for the neighbouring buildings of Vancouver's magnificent natural surroundings. 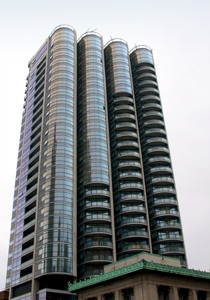 Jameson House is a model for reliable and efficient buildings, with redundant systems being utilized for both heating and cooling, ensuring both comfort and efficiency by recovering energy or taking advantage of outdoor conditions during Vancouver's shoulder seasons of milder temperatures. The facility provides sophisticated monitoring and controls for all building spaces, providing comfort and individualized settings for each and every residential suite. With an impressive and modern exterior design comes an equally impressive technologically advanced system at the heart of Jameson House. Almost every aspect of the building's mechanical equipment is integrated and connected to advanced monitoring and control equipment. Furthermore, every residential suite is outfitted with its own temperature adjustment controls connected to the central building system for seamless integration and calculation of all building parameters. Parkade gas detection and monitoring controls combine with heat recovery systems for effective use of heat energy. Steam supply from the central plant provides the rest of the necessary heat. Heatpump units throughout the commercial and retail spaces, combined with efficient fan coil units, cooling towers and chillers complete a highly effective cooling system. Modern Systems incorporated a highly robust LonWorks® controller network with full implementation for all suite controls, central heating and cooling systems, commercial and retail spaces and parkade ventilation. In spite of the sheer number of controllers, complex sequences and automation traffic on the communication network, Modern System's infrastructure is designed to handle the building's needs gracefully and provide useful graphical interfaces to the abundance of data. The success of the Jameson House development is reflected in the enthusiasm and accolades it has gathered through its many awards as well as the vibrancy it has brought to the neighbourhood. 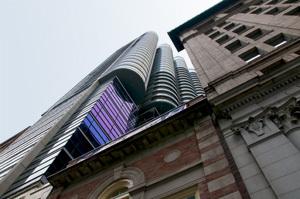 The seamless integration of a modern building within the historic, restored street level architecture is enhanced by the seamless integration of the building's control system. The user interface allows for clear overviews of sensors through the building and immediately alerts building operators of malfunctions or alarm conditions. Modern Systems' robust communication networks provide data from a variety of mechanical devices and monitoring points and a full range of data logging and trending tools offer invaluable information for fault-detection and energy efficiency management. Continued reliability and performance is protected and enhanced with this complete and sophisticated controls solution and we continue to support and share in the success of this modern Vancouver landmark.